Globe Electric's Incandescent vintage designer 60W Vintage Edison G40 Vanity Tungsten Incandescent Filament Light Bulb with E26 base. In the early days of electrical lighting, inventors such as Thomas Edison tested and retested as they searched for long-burning filaments. In 1890, the filament choice was carbonized cotton. Globe Electrics bulbs have a tungsten filament, which is used to reproduce the single hairpin loop of a vintage design. Position it within a clear shade or exposed socket to enjoy its shape and ambient glow. This Edison inspired bulb is a Steampunk favourite with its glowing cage-shaped filament surrounding a central glass support. Crafted to preserve the look of early 20th-century lighting. Please note, these bulbs are not as bright as modern bulbs of the same wattage and are recommended for exposed socket fixtures. Glass has a goldish amber tint which can vary in degree from light to medium. These bulbs can be dimmed and have a lifespan of 3000 hours. TUNGSTEN FILAMENTS: specially designed & shaped bulbs with Imported Tungsten Filaments gives your home that extra special unique/warm touch! Tired of changing light bulbs that burn out too frequently? Try the DuraMax line of Globe Light bulbs. DuraMax Globe Bulbs meet your decorative lighting needs while reducing the hassle of replacing your bulbs every few months. Ideal for bathroom vanity strips and decorative light fixtures. White Bulbs help reduce glare. Tired of changing light bulbs that burn out too frequently? Try the DuraMax line of Chandelier Light bulbs. DuraMax Chandelier Bulbs meet your decorative lighting needs while reducing the hassle of replacing your bulbs every few months. Ideal for chandeliers and decorative light fixtures. Clear Bulbs add a decorative sparkle. Tired of changing light bulbs that burn out too frequently? Try the DuraMax line of Globe Light bulbs. DuraMax Globe Bulbs meet your decorative lighting needs while reducing the hassle of replacing your bulbs every few months. Ideal for bathroom vanity strips and decorative light fixtures. Clear Bulbs add a decorative sparkle. 01320 60W Vintage Edison G30 Vanity Tungsten Incandescent Filament Light Bulb, E26 Base Globe Electric's Incandescent vintage designer 60W Vintage Edison G40 Vanity Tungsten Incandescent Filament Light Bulb with E26 base. In the early days of electrical lighting, inventors such as Thomas Edison tested and retested as they searched for long-burning filaments. In 1890, the filament choice was carbonized cotton. 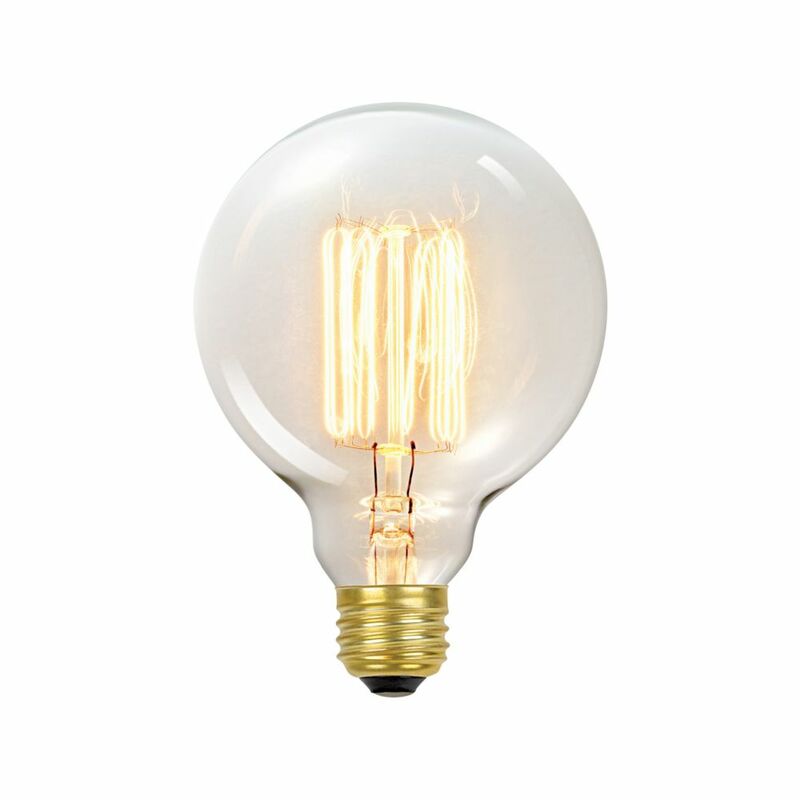 Globe Electrics bulbs have a tungsten filament, which is used to reproduce the single hairpin loop of a vintage design. Position it within a clear shade or exposed socket to enjoy its shape and ambient glow. This Edison inspired bulb is a Steampunk favourite with its glowing cage-shaped filament surrounding a central glass support. Crafted to preserve the look of early 20th-century lighting. Please note, these bulbs are not as bright as modern bulbs of the same wattage and are recommended for exposed socket fixtures. Glass has a goldish amber tint which can vary in degree from light to medium. These bulbs can be dimmed and have a lifespan of 3000 hours. 01320 60W Vintage Edison G30 Vanity Tungsten Incandescent Filament Light Bulb, E26 Base is rated 4.0 out of 5 by 21. Rated 2 out of 5 by Debi from At $11.00 a pop, they didn't last very long. Several... At $11.00 a pop, they didn't last very long. Several broke & burned out after the first day. The one's that lasted look great, but looking into other brand's. Rated 5 out of 5 by Kaitlyn from Great! Love it!... Great! Love it! Rated 3 out of 5 by MrsD from It's Ok. The bulb gets a 10 out of 10 for aesthetics. It gets a 2 out of 10 for functionality. If you're looking for a bulb that is going to provide bright or white, clear lighting for makeup or shaving, this NOT the bulb. This bulb creates a orangey-yellowish glow...I imagine this is what it would be like to live in a sepia photograph. Rated 5 out of 5 by Teresa from Love the Edison lights. Made the old light fixture look... Love the Edison lights. Made the old light fixture look totally different!! Rated 5 out of 5 by AP from This bulb gives beautiful light. We use it in a ceiling mounted light base...it makes a great si... This bulb gives beautiful light. We use it in a ceiling mounted light base...it makes a great simple light fixture.